Cross and Cutlass: Introducing Linda Windsor and her new release, Healer! Introducing Linda Windsor and her new release, Healer! First, I'd like to congratulate, Reyna Mishler, who won a copy of Nightshade by Ronie Kendig!!!! Thanks to all who entered. Today I have a very special guest, multi-published, award winning author, Linda Windsor. Linda contacted me a few months ago to ask if I would read her newest release, Healer, and review it. Of course I jumped at the chance. I have loved everything I've read of Linda's. Come to sixth century Arthurian Britain as it’s never been seen in Linda Windsor’s latest novel, HEALER, book one in the Brides of Alba series published by David C. Cook. A woman orphaned during a twenty-year blood feud is destined to spend her life in hiding with only her wolf and faith in God as companions. Her mother’s dying prophecy forces her to flee from the enemy who would kill her and the remnant of her own clan who would have her lead them in vengeful retaliation. But Brenna is a healer, trained by the Arimathean Sisters of Avalon, not a warrior queen. So when a stranger is ambushed and left to die, Brenna has no choice but to rescue him. The man’s delirious rants leave her to wonder if his spirit will survive the darkness that enshrouds him and reveal that he had witnessed her clan’s destruction, though he’d been no more than a child. Only by faith does healing him come as easy as loving him…though the cost may be her life. With an estimated million books in print, Christy finalist and winner of multiple industry awards Linda Windsor is the author of 16 secular historical and contemporary romances and 13 romantic comedies and historical fiction for the inspirational market. Her switch to the inspirational fiction in 1999 was more like Jonah going to Ninevah than a flash of enlightenment. Windsor has never looked back with regret. When Linda isn’t writing in her restored late 18th century farmhouse, she’s busy speaking and/or playing music for writing workshops, faith seminars, libraries, and civic and church groups. She and her late husband were professional musicians and singers in their country and old Rock and Roll band Homespun. The author is currently working on The Brides of Alba trilogy, a family saga set in King Arthur’s Scotland. 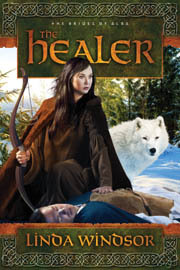 HEALER, book one of the series, was released in June 2010. Years ago my daughter was stalked and assaulted in college, blamed God in anger and turned to Wicca or white witchcraft. Little did I know that as I began to research and write about the Dark Ages in my previous Irish series Fires of Gleannmara and now in HEALER and the Brides of Alba series, that I would find historical information that would enable me to witness to her, when she would not hear the Word. These precious tidbits of early church history and the conversion of the druids, or wisemen/magi of the ancient world planted seeds, food for thought, that eventually brought my daughter back to Christ. And so my passion was kindled to reach out to young people and adults to share this information through fiction just as Jesus used parables to teach. HEALER is sprinkled with this information and underscored by the Word around a sweeping romantic adventure in Dark Age Scotland. In it, you will see nature magic, which evolved into today’s science, compared to dark magic. You will learn why the pagan peoples so readily accepted Christianity in the British Isles—reasons still valid today against New Age. Arthur, Merlin and others of legend are revealed as titles and HEALER’s Arthur and Merlin Emrys are historical figures who actually existed. They are descended, according to tradition, from the Davidic bloodlines preserved in the royal Irish by the marriage of Zedediah’s daughter to Ireland’s high king in the late sixth century B.C. and the apostolic bloodlines of Jesus’s family and friends, including Joseph of Arimathea. The survival of these holy bloodlines and Christianity itself figure heavily in HEALER’s storyline. For those who would read the nonfiction sources to find out more, I’ve included an extensive bibliography in the back of HEALER. I want to help others to reach out to nonbelievers seduced by New Age philosophies and to educate our young so that they can not be swayed from their faith because of mistakes the church has made in Christ’s name. These are the driving themes behind HEALER. Do not throw Jesus out with the dirty church water. The druids knew who He was before Christianity arrived on their shores. And worship the Creator, not creation. May you be blessed by this work as I have been. Linda Windsor’s Healer will go on my top ten list of favorite Historicals for the year. This is so much more than a romance. It is a story of prophecy, history, legend, rivalry, greed, forgiveness, and love all carefully threaded with an overlying theme of God’s power and love. Rarely does a book take me so far away from my own world that I truly feel as though I’m a part of the struggles, heartaches and joys of these characters as they lived in 6th century Scotland. With a rich history of Arthurian legend and early Christianity, this story will captivate you. I was also thoroughly impressed with the spiritual warfare depicted by the author, a subject not often seen in fiction these days. And one that heartily needs to be addressed in light of the growing interest and power in all things supernatural. I'm giving away my copy of this book to some lucky winner. All you have to do is leave a comment for Linda and I'll draw a name on Sept 10th. p.s. I'm really glad that Linda includes resources in the back of the book for further reading and as a witnessing tool to non-believers. That's so cool. Good Morning, MaryLu; and Good Morning, Linda. I just finsihed watching the Trailer for Linda Windsor's new book - "Healer" ... and between the celtic-style music playing, and, the wording chosen to describe a little about the story ... it sounds really exciting, interesting, intriguing, and, that it would be a terrific read ! Would love to read this book ! Thanks so much for entering me in this contest. Take care, and have a God-blessed day, ladies ! This sounds great! It's a time period that's not often written about, and I really like books that have lots of spiritual warfare. Please enter me, and thanks for the opportunity! This book sounds very interesting. Since I've started reading your novels, MaryLu, you have recommended some great authors. I just finished reading Kaye Dacus' Ransome's Honor and Ransome's Crossing. They were great novels! She is definitely my go-to author when I run out of your novels to read. Thanks for the recommendations. This sounds like a great book! I'd love a chance to win! :) Thank you, MaryLu! Sounds like an interesting book! I'm enjoying the fact that you've been posting reviews about books you've read. Always looking for new Christian romance authors to try out, and you're intriguing me with these last couple you've posted! I've loved Linda's books, they are always wonderful. The Healer sounds so interesting and delves into many things new to me. I've lost a niece to Wicca, so it's encouraging to hear that her daughter was brought back to the Lord. Please include me in the drawing. Thanks! This book sounds great! Please enter me in for the copy! How intriguing! I love reading books where it's obvious the author has done her homework. Please include me me. This looks like a GREAT book! I just love Linda Windsor's books and can't wait to read more!! This sounds like a book right up my alley!!! Keep up the good work Christian fiction authors!!! This is my favorite time period!!! Ohhh!! I would so love to win a copy of this book!! Thanks for the opportuniy! OOOOOO, I love this period and how it connects with early Christianity too. I would read anything connected with Celtic Christianity, so I would really like to win this! I'm writing the name of it down to buy in case I don't. Ooops, forgot to leave my address.